I haven’t always been an advocate for this little root vegetable, but about a year ago my friend Nikole and George had a dinner party with this amazing beet salad. I just feel in love with roasted beets covered in balsamic dressing. Trust me if you asked my mother I used to have standoffs at dinner with my beets, and house rule of “two bites” of each item on your plate. As an adult I understand the rule, but as a child I hated it! There were mornings where I still had beets sitting on my plate waiting for me before breakfast was served. I might be a bit stubborn, but not as stubborn as my mother ha! Funny how our tastes change as we grow. This salad is super easy to make! Start with beets that are firm and feel heavy for their size (I used 6 beets). If the beets came with their greens still attached, cut off the greens, wash them, and reserve them for another use like your morning smoothie. 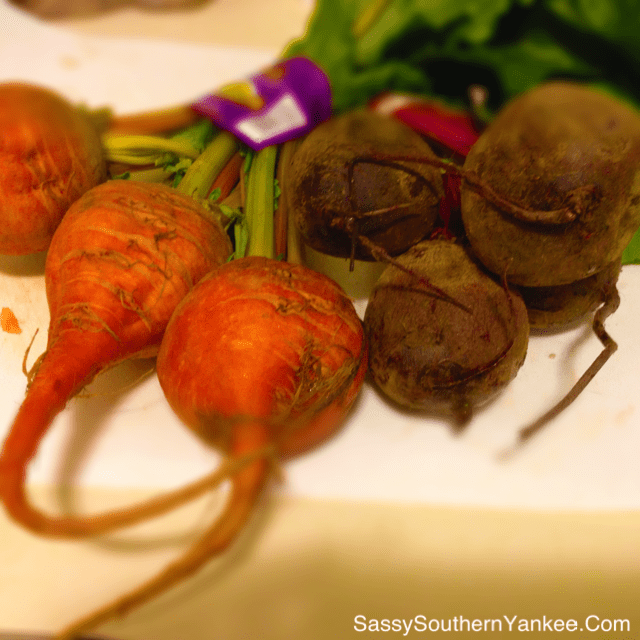 Depending on your grocery store or local farmers market you can find a yellowish orange beet these are my favorite! Rinse any dirt or debris from the beets—some beets may need to be scrubbed clean. Put beets on a large piece of aluminum foil and preheat the oven to 375°F (note: beets are fairly flexible veggies, if you have something else in the oven at anywhere between 325° and 425°, beets will happily roast up at that temperature alongside what you’re already cooking, it just will take a bit longer at lower temperatures). Drizzle the beets with a bit of oil before roasting. I like to use olive oil, but grapeseed oil or canola oil work just fine, too. Sprinkle the beets with salt, too, if you like. Note: If you’re planning on making a salad with the roasted beets, feel free to use plenty of oil here—you can use the beet-infused oil in the dressing when they’re done roasting. Remove the beets from oven when tender (you should be able to easily pierce them with a fork). Let them sit until cool enough to handle. When the beets are cool enough to handle, slip their peels off. You can use a paring knife, if you like, but you can also marvel at how easily the peels come off with just a rub of your fingers. If you don’t want your fingers a beautiful pink shade than a piece of paper towel works wonders too! Next chop the beets into 1/4 inch pieces and set aside while we work on the dressing. I always have a jar of balsamic vinaigrette ready to go in my fridge. I use it almost daily on salads, spread on sandwiches, or drizzled over vegetables. It’s so versatile I rarely bother to make any other kind of salad dressing. And it certainly beats store-bought options with their cheap oils and high fructose corn syrup. A versatile vinaigrette with a touch of sweetness – so much better and healthier than store-bought salad dressings. I make a jar at a time and use it on everything – salads, sandwiches, drizzled over grilled vegetables. Makes approximately 13 ounces of vinaigrette. Take the beets and toss them with a bit of the Honey Balsamic Dressing. Just a light coating will do, no need for the beets to go swimming in the dressing. After the beets are dressed I love to throw in a few candied pecans that I found in the baking section of my local grocery store. Another alternative that is equally as delicious is to add a bit of fresh Feta Cheese. 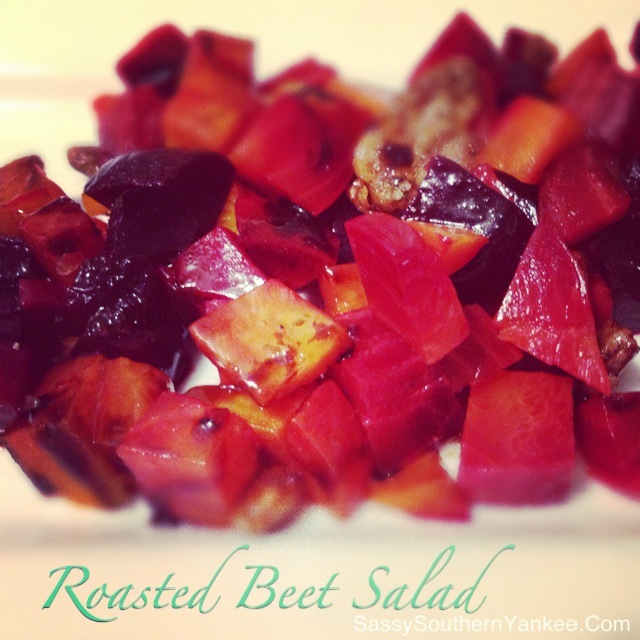 I hope you enjoy this roasted beet salad with honey balsamic dressing as wonderful and healthy as I do! Its the perfect kick off to a healthy New Year! Rinse any dirt or debris from the beets—some beets may need to be scrubbed clean. Put beets on a large piece of aluminum foil and preheat the oven to 375°F (note: beets are fairly flexible veggies, if you have something else in the oven at anywhere between 325° and 425°, beets will happily roast up at that temperature alongside what you're already cooking, it just will take a bit longer at lower temperatures). 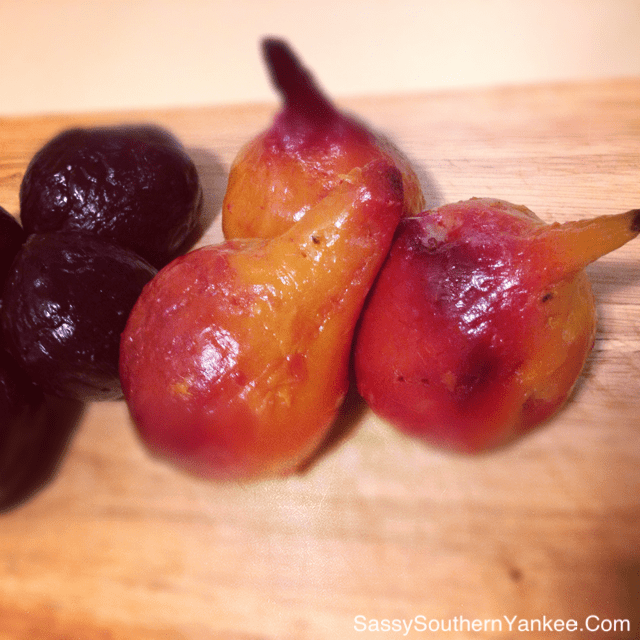 Drizzle the beets with a bit of oil before roasting. I like to use olive oil, but grapeseed oil or canola oil work just fine, too. Sprinkle the beets with salt, too, if you like. Note: If you're planning on making a salad with the roasted beets, feel free to use plenty of oil here—you can use the beet-infused oil in the dressing when they're done roasting. For an even roasting of the beets, fold the foil over them and crimp the sides closed. This helps keep them moist, it also helps contain the powerfully staining juices they'll emit while roasting and make clean-up a snap. Remove the beets from oven when tender (you should be able to easily pierce them with a fork). Let them sit until cool enough to handle. When the beets are cool enough to handle, slip their peels off. You can use a paring knife, if you like, but you can also marvel at how easily the peels come off with just a rub of your fingers. If you don’t want your fingers a beautiful pink shade than a piece of paper towel works wonders too! Next chop the beets into ¼ inch pieces and set aside while we work on the dressing. For the Dressing~ In mixing bowl measure honey, mustard, salt, pepper and crushed garlic. Stir with fork to combine (you can use a whisk if you’re using minced garlic; the crushed garlic clove tends to get caught in the wires). Store in a jar with lid (a repurposed jam jar works nicely). Keeps indefinitely in refrigerator. I like to leave the garlic clove in, where it sits at the bottom of the jar and continues to release its subtle garlic flavor. But if you are afraid you’re accidentally going to get in your salad, you can fish it out with a fork and discard it. Makes approximately 13 ounces of vinaigrette. This entry was posted in Salad, Side Dish and tagged balsamic dressing, beets, candied pecans, Gluten Free, Healthy, honey, Paleo, Recipe, Roasted Beet Salad with Honey Balsamic Dressing, salad. Is this beet recipe better warm or cold? The recipe is cold. I’m sure you could eat it warmed but I’ve never tried it that way. Very disappointed. Too oily and hardly any flavour. Yummy. This was very good. I thought it was good! I added cut-off-the-cob roasted corn into mine (from a previous night’s meal).